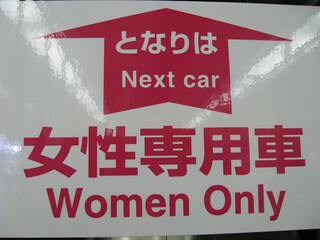 I had heard about women-only cars on the trains in Japan, as well as some women-only buses in Mexico. So when I saw this sign, I had to take a picture of it. Not a minute after I sat down, in the mixed-gender car I had entered, an older man came up to me and started gesticulating wildly. I thought he wanted to pull down the shade behind me, or something? So I stood up. He and I were roughly the same height (that is to say, short, around 5’1″). Next thing I knew, he had ousted me from my seat. He pulled down the shade and then sat down, spreading his legs as wide as was humanly possible and holding up his newspaper as a literal shield. it’s when someone sits on public transit and, presumably for reasons resulting from an unbearable, scorching heat in their groin, must spread their legs wide. The vast majority of the time, this is a man. The vast majority of the time, they encroach on the personal space of a woman. This entry was posted in Travel and tagged feminism, travel on October 16, 2013 by slowbloom. 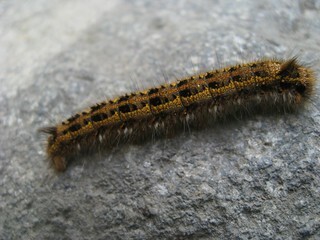 This week the prompt for 52 Photos Project is Starts with ‘C’. 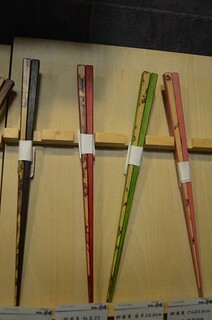 And finally, some fancy chopsticks! 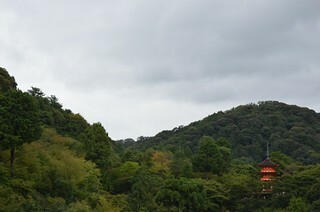 This entry was posted in Photos, Travel and tagged 52photosproject, japan, photos, travel on October 15, 2013 by slowbloom. I just spent 3 weeks in Japan, traveling around Honshu, the largest island. 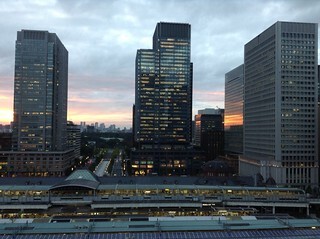 My last evening was spent in Tokyo, with my mom. 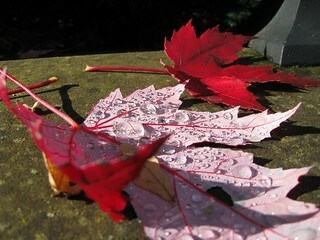 We were exhausted, having tried our damnedest to fit it all in, even while resting. I could tell you about the middle-aged woman we met in Kamikochi, who was there with her husband and parents. She turned out to be a librarian, and she had her iPhone wrapped in a fuzzy bunny that she would pull out every time her husband asked her a question. I could tell you about the young woman in Nara who waited on us in an Italian restaurant and didn’t know any English, but her desire to serve us overwhelmed all fears of exposing her bad language skills. There was the elderly gentleman who conferred with us on our journey out of Koya-san who had lived in Texas for 5 years, and the young people who worked in the ryokan we stayed at in Kyoto. And the monk with the scar on his scalp at the temple where we stayed in Koya-san whose entire body was an apology. But this story is for this cup of tea. One thing seasoned travelers know and understand is that you have to make choices all day long, about everything. About the things that you’ve automated in your daily life at home, like where to find your next meal and what to eat for breakfast and lunch and dinner. This may sound like a treat, but trust me, after 22 days of this, I start to wish I had a refrigerator with some leftovers I could just pull out. Sadly, the restaurant did not have a view. But the staff more than made up for it. When we returned to the restaurant, there was a group of men sitting on a bench outside the entrance. We had seen many lines with seats, so we assumed there was a wait and sat at the end of the bench. We knew it wouldn’t be long before we were seated, based on previous experience. Soon enough, the group was seated and the host/maitre d’ saw us. His face lit up with recognition and he motioned that we should wait a minute. Next thing we knew, he was ushering us in to sit at the bar. He pointed to something on the menu, which I could only guess was “Sapporo” and I said, “Hai! Yes.” I told him I wanted a small one. Having given him the sufficient information, he disappeared and I sank into my chair, elated to have completed the transaction. He returned shortly with my beer and a small bowl, filled with something lumpy and covered in a whitish sauce. He told me it was a pickle, and he stood behind my chair waiting for me to try it. I inspected the bowl and willed my stomach not to churn. It seemed to contain some chunks of chicken, and I considered that maybe they were cured, like ceviche. 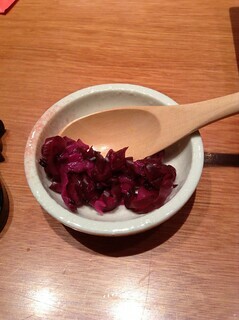 I didn’t know of any Japanese cuisine that cooked meat that way. I screwed up my courage and stabbed my chopsticks in and plucked out one of the blobs, which threatened to slid out of my tentative grip. I got it in my mouth first and sank my teeth in, relieved to discover it had been cooked. It was cooked! Hallelujah! The maitre d’ stood behind us, waiting to see what I thought. “Pickle?” I said to him. I hoped my smile covered my confusion, the lack of vinegar or any acidic tang in my mouth. “Good,” I said, smiling at him. He turned and left. Except this time there was three times as much. 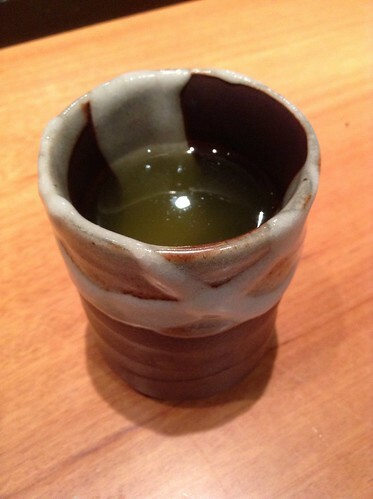 Shiso has a strong perfume and a mild cinnamon flavor, the texture like a cucumber. I knew there was no way I could eat that much of it, no matter how delicious. I hope he wasn’t offended. My mom and I enjoyed our meal, the chicken grilled with leeks, the eggplant, the shishito peppers, and the mushroom stems in butter sauce. Not to mention the giant piles of shiso pickles. Our bodies sated, we rested in our seats, savoring our final evening in Tokyo, the city whirling outside while we relaxed. And then this third gift came to the table, warm and bright. I wrapped my fingers around the warm ceramic bowl and lifted it to my nose, inhaling the sweet and mildly bitter aroma of the tea. 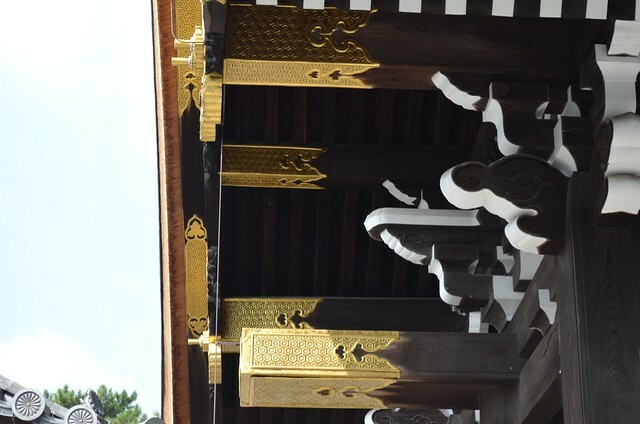 By this point in our travels, we had drunk many cups of tea – from the iced tea offered us in steaming Kyoto to the many pots we brewed in our various lodgings. And this was the best cup of tea. From a technical standpoint, it was perfect – the perfect temperature, perfectly steeped. It was more sweet than bitter, warm but not scalding, grassy without being pungent. It was made all the sweeter for being our reward, for connecting with people, for having made the effort and being met, for being seen as a fellow human, another traveler on the road. May all your cups of tea be a sweet reminder of our universal connection. This entry was posted in Travel and tagged food, gratitude, japan, photos, travel on October 10, 2013 by slowbloom. 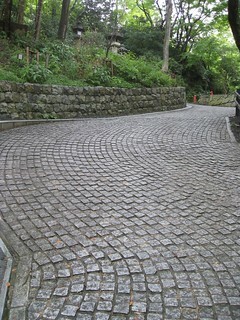 As many of you know, I was in Japan for three weeks. This week’s prompt: seasonal color / gold could have been fulfilled by a few pictures I took of the maples just starting to turn. Instead, I wanted to stretch a little beyond the obvious. 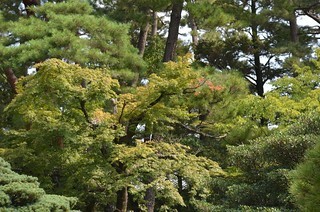 This image was taken on the grounds of the Imperial Palace in Kyoto. I love the contrast of the warm metal against the monochromatic paint. This entry was posted in Photos, Travel and tagged 52photosproject on October 8, 2013 by slowbloom.